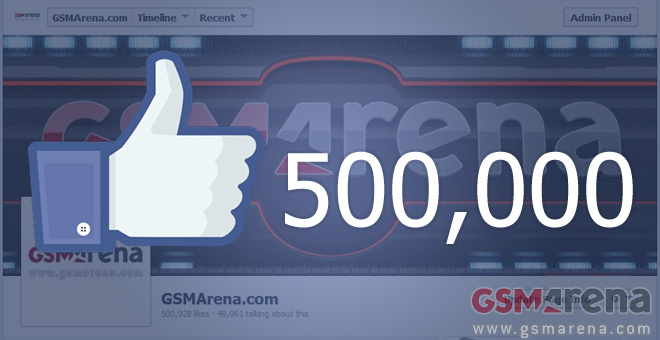 The GSMArena.com Facebook page is now liked by more than 500,000 people around the world! This makes us one of the most popular mobile websites on Facebook, and that really makes us proud. The support we are getting is really raising exponentially, as the last 50,000 likes came in just 10 days! In September 2011 we hit 100,000 page likes and exactly 9 months later in June 2012 the likes counter showed 200,000. Now, in October 2013, we’ve hit the cool 500,000 likes and we really can’t thank you enough for this! Thanks to you, our faithful readers, now our servers are serving close to 9 million pages per day and according to the independent internet statistic company Alexa, we’re now the 316th most popular site in the world, regardless of genre. Our Facebook fan base is now larger than the population of Malta or Iceland and in a matter of days our GSMArena Facebook page will have the same number of likes as there are people in Luxembourg. Shoutout to everyone living in the countries above as well as everyone else around the world, who supports us! For those of you with no Facebook account, we feel and appreciate your support, too, through our feeds and comments, so a big thank you goes to you as well. We put a lot of effort in the work we do and your appreciation whether its in the form of a comment, Facebook page like, Google +1, a Follow on Twitter of even a simple email feels great! Here’s hoping that the best is yet to come though, and there will be more and more reasons for you to come back to our homepage time and again in the future!